It is not often that I wake up and head straight for a beer, but MSU homecoming is one of those select times of the year. I just returned from a frigid trip to Montana. MSU homecoming took place last weekend, an event I’ve only missed once since graduating in ’91. I flew into Billing on Thursday night to spend some time with my family, and on Friday my father and I hit the road to Bozeman. Homecoming weekend is always a health shocker. Bad food, no sleep, and great beer lead to a rough couple of days. My Fraternity, Pi Kappa Alpha (Pikes), always puts on a full schedule of events over the weekend to keep everyone busy. Numerous brothers return from across the country and the furthest reaches of Montana, which leads to a great reunion weekend. 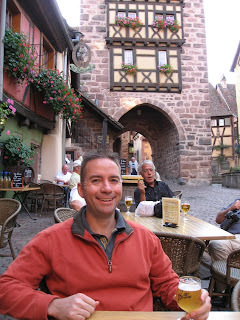 The problem is that after a long Friday night reminiscing about the “good old days” over several beers and the occasional single malt, and getting back to the hotel at 2 am, it can be challenging to wake up at 8 am on Saturday to socialize before the morning parade. But I always seem to find a way to persevere. I am not a fan of red beers, nor do I drink coffee or the caffeine/energy drinks that are so popular nowadays, so finding the proper breakfast beer is key to starting off a long day. In my opinion, the best breakfast beer in the world is an authentic German Hefeweizen. It is what the Bavarians drink in the morning, and for good reason. The unfiltered beer contains vitamin B rich yeast, which are great for one’s health, complexion, and spirit. And the Flüssiges Brot makes a great wheat substitute for my normal breakfast toast. In the absence of an authentic Hefeweizen, my second choice to kick off the day is a nice Guinness draft. Guinness is a low alcohol, low calorie drink and another great option to ease one’s way into the morning. Well, good Hefeweizens are hard to find in our normal Saturday morning haunts, so in the years past I have started the day off with my second favorite breakfast beer, draft Guinness, at the Rocking R Bar. But the R-Bar, and a number of other surrounding buildings, were destroyed in a gas main explosion last March. (Very tragically Tara Reistad Bowman lost her life that morning as she arrived for work at the Montana Trails Gallery.) This explosion was felt around Montana, and it especially rattled the tight community of Bozeman. There is still a big hole in the ground where buildings once stood in the historic district of downtown Bozeman. 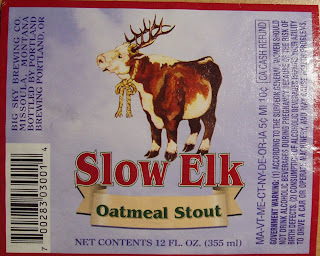 So this year, in the absence of a German Hefeweizen or Guinness, I chose a local stout for breakfast – Big Sky Brewing Co.’s Slow Elk Oatmeal Stout. Oatmeal sounds suitable for breakfast, right? 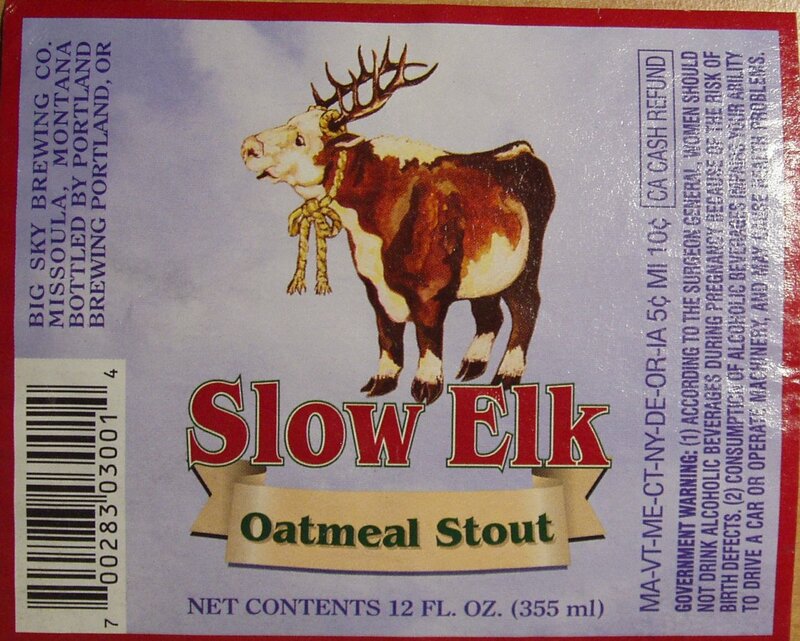 Like Guinness, Slow Elk is a stout, but packs much more of a punch than its Irish counterpart. But nonetheless a great way to start off the day. (“Slow Elk” is a Montana hunting term for a cow… Don’t ask.) So a couple of these helped me take the edge off. (Unfortunately, no sooner was I taking it off than I started adding it back on.) The parade lasted about an hour, and after its conclusion, we packed up and headed to the football stadium parking lot for the Pike tailgate, which including more food and beverages. I brought an ice filled cooler of Slow Elk along with some of Bayern Brewing’s (Missoula) Oktoberfest. (When in Montana I always pick up a couple six packs of local beer.) Bayern’s Oktoberfest is a great autumn seasonal, albeit fairly dark and a touch too rich for the style. It does boast a huge Munich-malty backbone. I would place it squarely in the German Dunkles category. Aber macht nichts, it is nevertheless a great beer. And it is nice to see wonderful dark lagers being made in Montana. Their head brewer, Jürgen Knöller, has his master brewer’s diploma from Weihenstephan, and it shows in the quality of Bayern’s beers. Now I know some beer enthusiasts claim that great microbrews are not intended to be iced down in a cooler. But on this day, my needs were a little bit different than normal. The low in Bozeman was predicted to be -4 deg F. (A hard, early October frost – even by Montana standards!) I needed some ice in the cooler to insulate the beer and keep it from freezing! The temperature did creep up in to the teens for the game, but drinking gloves were still required through out the day. 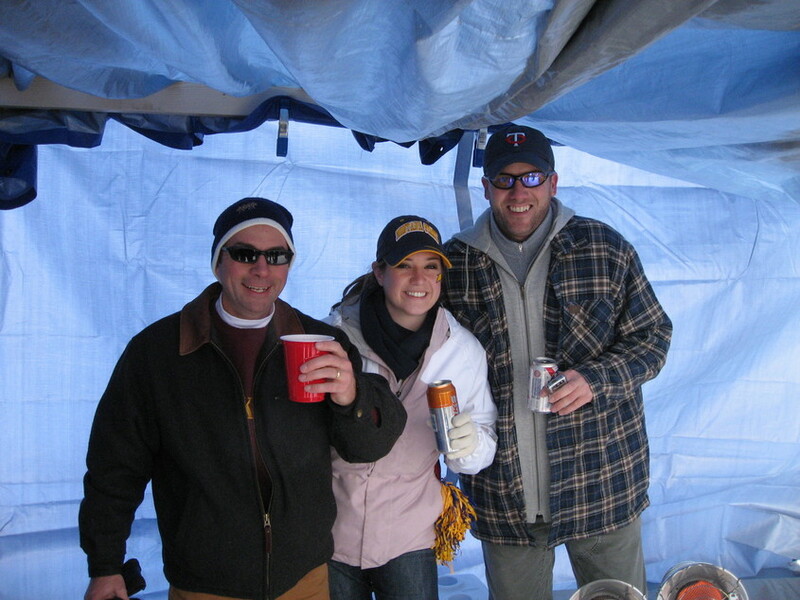 Scott Countryman (coming down from Whitefish) always thinks ahead and had a propane heated 2x4 and tarp shelter for everyone to congregate under at the tailgate. So the tailgate was comfortable, but the frozen seats in Bobcat Stadium were not quite as nice. Anyway, it was still a great excuse to break out my lined Carhartts and the rest of my winter clothes. All in all it was another wonderful Homecoming weekend, spent with great friends and great drink – all kicked off by a new, local breakfast beer! There are a couple of items I’d like to update you on before I head to Bozeman this weekend for MSU homecoming. First, as you know, the Great American Beer Festival has already come and gone. The week before the GABF was “Denver Beer Week,” which offered beer enthusiasts numerous events to get them fired up for the big finally. One of those events was a tapping of the GABF Pro-Am beer that I brewed with the Wynkoop – a Dunkles or dark German lager. (See my June 29th entry titled “GABF Pro-AM With The Wynkoop.”) My wife and I returned from Europe on Monday, September 21st, and the next day after finishing up at work I tiredly made my way down to the Wynkoop to “tap” the Dunlkes with brewmaster Andy Brown. It was surprisingly crowded for a Tuesday night, but the beer week activities and lure of a free pint didn’t hurt I’m sure. The tapping went well, and the Dunkles has been a big hit ever since. It is clean, rich and smooth with a nice, albeit barely perceptible, noble hop backbone. Our beer did not place at the GABF Pro-Am, but I am not all disappointed. People seem to love it! And it was a complete thrill just to be involved in this homebrewer’s dream, and it is truly an honor to have one of your beers served at the GABF, and to be on tap at the Koop. Last Friday there were still some of the 600 gallons left, so if you’re in the area stop by, try it out, and let me know what you think! Second, I’d like to give you an update on the Rochefortesque beer I brewed back in April. (See my April 23rd entry titled “Rochefort Question.”) This beer turned out very well. It is a rich red color with a sturdy head. The nose is effervescent with notes of rich malt, dark fruit, and some alcohol. (It finished at 9.03% abv.) The flavor builds on the aroma with more of the above along with flavors of Munich & caramel malts and hints of caramelized dark candy sugar. The Nachtrunk is long and warming with more dried fruit character. After enjoying this beer for a couple of weeks I decided to ruin it by comparing it to a Rochefort 10. (I hate doing this because I always end up disappointed.) My beer actually stood up pretty well to Rochefort in flavor, but I noted that the Belgian classic had a better nose and finish than my beer. The 10 is an almost perfect beer for its style, and I’m just not sure how to copy something like that. It was also a touch darker and more highly carbonated than my prototype – a couple of items that I’ll touch up in the future. It is definitely a beer I will brew again. Next time I plan to slightly increase the Special B to contribute a bit more color and strengthen the malty-fruity complexity. I may even try a bit of the coriander that I was asking you all about back in April. With all of that said, this beer did take 1st place in its category at the Eastern Idaho State Fair – a BJCP certified event that happened to be conveniently timed. (BJCP category 18E) To tie this blog entry together, I’d like to take this BJCP award winning beer and do another GABF Pro-Am again next year. Hopefully the Wynkoop will be open to another Pro-Am in 2010!